There's a Bob Spencer song that used to be on the ABC called Bob the Kelpie. By the way, Don Spencer is Russel Crowe's father in law. Well, a kelpie is an Australian breed of sheepdog. They are named after mythical beasts from Scottish folklore. Unlike their namesakes, they don't especially like water. they can jump over the stockyard fence and run along the backs of the sheep in the yard. They are very intelligent and learn how to follow the directions of their shepherd. They are also very gentle and don't usually bite the sheep (unlike their Aussie counterparts the blue heelers who nip the heels of the cattle). When they are rounding up sheep they go into "stealth mode" and circle around the flock preventing escapees. They get down low and go, go, go! The kelpie will stare at the sheep as if willing them to stay put , it really does look like the dog is psyching out the sheep. 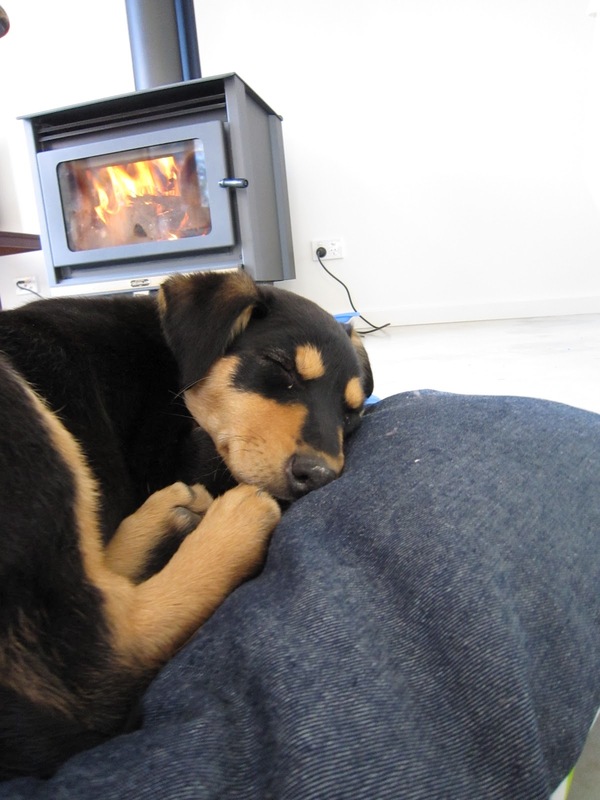 Our kelpie Maggie is a pure bred dog, from working parents. We think there might have been a minor deformity which caused the breeders to sell her to the petshop rather than keeping her as a working dog. At any rate, she has never been trained to work sheep, she is a pet. She was about 10 weeks old when we bought her. We chose her because she was the prettiest of the litter. It is highly unusual to see a litter of kelpies at the petshop, Hubby spotted them in the window on his way to the post office one day. He sent me a photo on his phone and I had to go in to town the next day to inspect them. We left the Pickle at home that time so she did not get her hopes up. But she did come with us when we bought her. I was a bit nervous that as a kelpie she would get bored and start to tear our house apart. Hubby wanted a "real dog" instead of the shih-tzhu. We have plenty of room for her to run around. Her favourite activity is to chase a ball, but she will chase a stick or a magpie if there is one around. She is named Maggie after Margaret "Hot Lips" Houlihan from MASH. So far all of our pets have been named after MASH characters. We had a budgie named Radar, and our other dog is BJ. Well, we would've looked a bit silly calling her Hot Lips so we decided on Maggie. Kelpies come in a few different colours, but Maggie is black and tan. Koko the kelpie who stars in the Australian film "Red Dog" is red, obviously. I highly recommend that movie, if you like love stories and dog stories this one is perfect for you! Much much better than 'Marley and Me'. Maggie is gentle and kind. She loves to be outside. When she is worn out from running around chasing things she will lie by the fire with her nose under her paws and snooze. She never chases cars since she is a bit scared of them. She doesn't like the hose much either. She really is the perfect pet for our family. Maggie is adorable. It was nice to learn about this breed. She looks like my Chloe in a much larger version. Very cute doggie! She looks very huggable! What a darling dog! I've never heard of this breed - I'll have to look it up in the Encyclopedia of Dogs. 'Red Dog' sounds like a movie we'd enjoy.